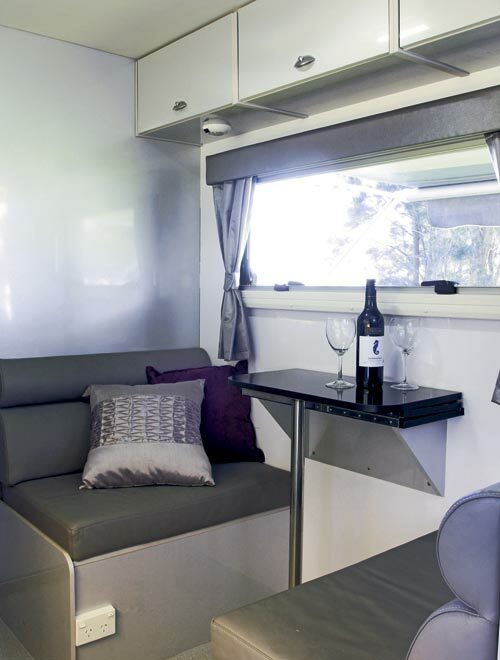 Grandcruiser has worked to incorporate the best they’ve seen in a new fibreglass caravan designed to cope with Australian conditions. It’s certainly a good advertisement for the alleged benefits of fibreglass construction, with its smooth rounded corners and high gloss gelcoat finish. That there are no accessories bolted to the rear – spare wheels, jerry cans and so on – adds to the clean, uncluttered look. Inside, the dedication to clean design continues. The colour scheme is muted, in fact it’s positively low-key compared to some of the festive interiors we see these days. It certainly creates a positive first impression. All the cabinetry and furniture in this van is made from a plastic material that is said to be tough, resistant to scratching and easy to clean. 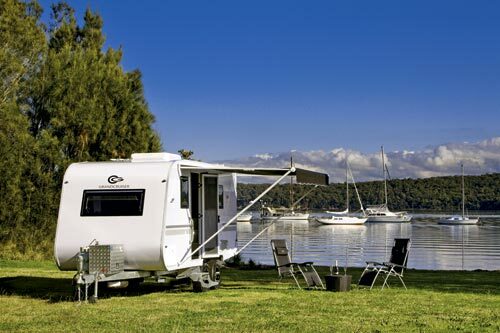 The 1750 has a huge galvanised chassis built of 400-grade Australian steel. On it sits the 45mm thick sandwich floor, with fibreglass underside for protection and high-grade foam for strength and insulation. The walls and roof are each a one-piece engineered sandwich, with fibreglass on both sides bonded to a high-density structural, fire resistant foam core that doesn’t absorb water. In other words, there’s fibreglass on both sides of the structural foam. The front and rear sections are each one-piece panels made from very high-strength fibreglass, like the hull of a boat. The body is bonded together using SIKA industrial adhesives normally used in aircraft and boats. 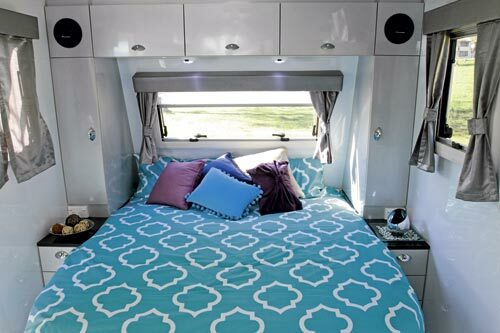 A queen-size island bed, with the front corners chamfered to make more room, occupies the front of the van. The bed is surrounded by storage space in the form of overhead lockers and vertical lockers, each with a set of drawers below, on either side of the bed. A 19in flatscreen TV is swivel-mounted at the junction of the uppermost kitchen cupboard and the wall. The kitchen is along the offside wall. 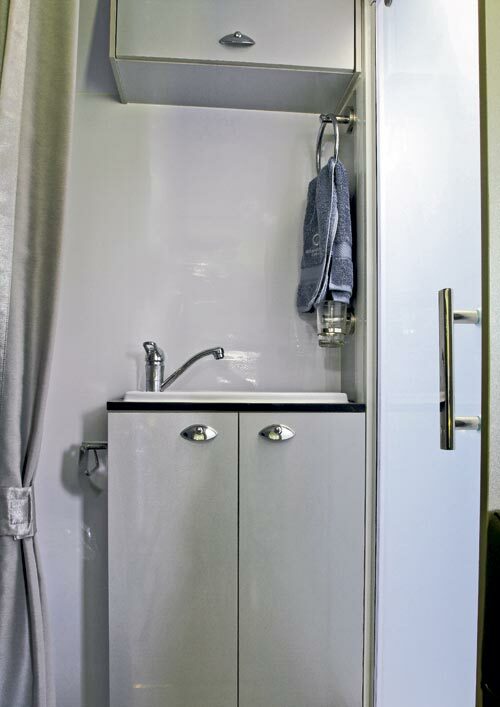 As many drawers and cupboards as practically allowed have been built into the cabinet above and below the stainless steel sink, and one of these cupboards contains the gas/240V Suburban hot water system. To the right of the sink is a Dometic gas/electric stove and grill, and above that a fan-forced range-top. The Dometic three-way fridge-freezer has a capacity of 150L. Opposite the sleek kitchen is a café-style lounge. Much has to be made of a small space when designing an eating area like this one. Here, the builders have opted for a two-bench arrangement separated by a tri-fold table. 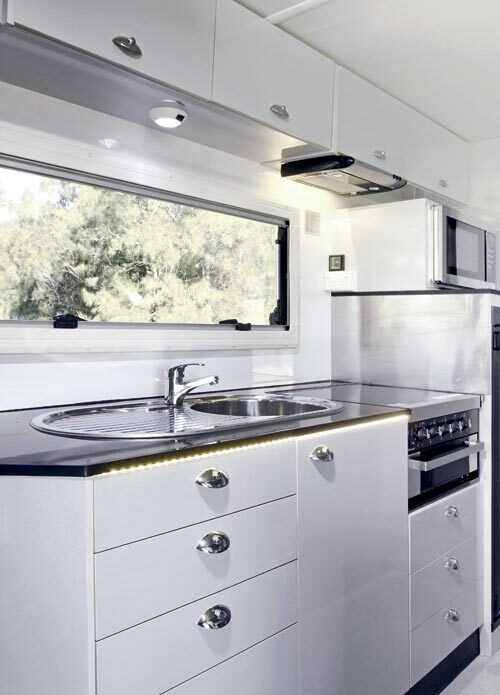 Shoe-horning an ensuite bathroom into an 18ft van isn’t exactly child’s play but Grandcruiser has pulled it off and this will, no doubt, be one of the van’s big selling points. The shower, with an internal light and fan, was larger than I expected. It’s positioned on the right-hand side, a small sink with a vertical vanity is in the centre and to the left of that the cassette toilet. The van in designed for those who like remote free camping, so two 9kg gas cylinders provide a power source for the fridge, stove and hot water service, which means you can pretty much pitch camp until your water tank runs dry. 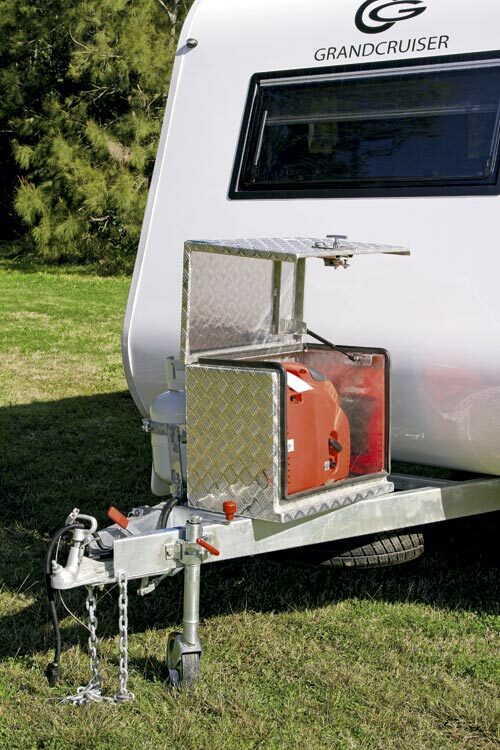 A Power-Pro generator, housed in an aluminium checkerplate box on the drawbar, provides 240V grunt if you want to run a pressure washer and/or power tools, charge the battery, etc. 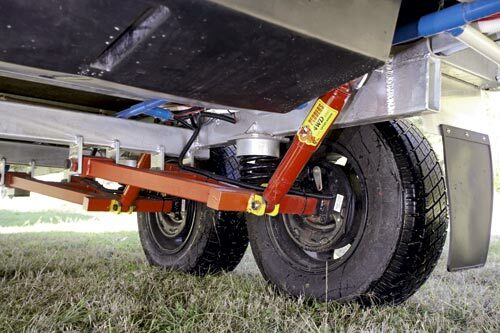 Offroad ability is enhanced with Grandcruiser’s own independent trailing-arm suspension, employing coil springs and Pedders gas shocks, over 15in alloy wheels with 10in electric brakes. In this case, having four wheels rather than two accommodates the extra weight inherent in a fibreglass van while providing optimum stability on sealed surfaces. The fibreglass versus aluminium debate has raged unabated like a storm on Saturn but David is obviously convinced that fibreglass construction offers advantages that an aluminium-clad product can’t match. “It’s simply a better way to build a strong, aerodynamic van,” he said. That the 1750 has a water capacity of 170L, which gives you an idea of who will examine this van with keen interest. 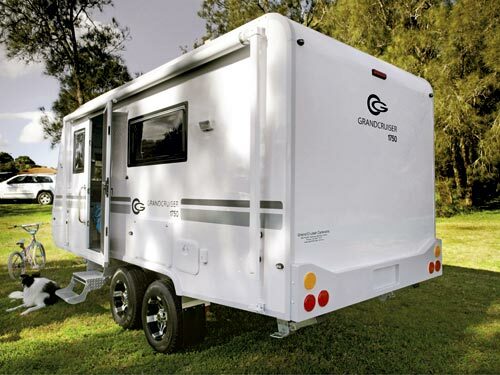 David said Australians won’t be buying $80,000 and $90,000 caravans as they once did, or not for a while anyway, so he aimed the 1750 at what seems to be a new market: free campers with smaller 4WD vehicles and less opulent budgets.